Over the last 15 years, tyres have been responsible for significant improvements in active safety. To this end, premium tyre manufacturers in particular, including Continental, have developed more advanced compounds, brought the construction of their tyres into line with the state of the art and optimized their tread patterns. As a result, braking distances have become much shorter, handling precision has improved immensely and rolling resistance has been significantly reduced. True, when comparing a new tyre with its direct predecessor, the development engineers can usually claim “only” single-digit improvements in percentage terms. But comparing a tyre from 2000 with a current model reveals what remarkable progress has been made. When the wet braking performance of a current tyre and a tyre with the old design were compared, the difference was almost 20 percent. Continental conducted this unusual comparison at the Continental TechShow 2015. 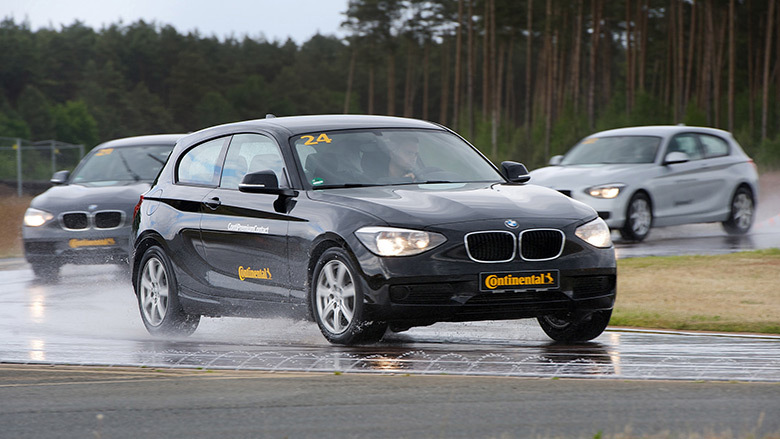 In the test, a model year 2015 BMW 1 Series model was fitted with ContiPremiumContact passenger tyres from model year 2000 with the construction and tread typical of that tyre at the time. Then the test engineers fitted a car from model year 2000 with the latest ContiPremiumContact 5 tyres. 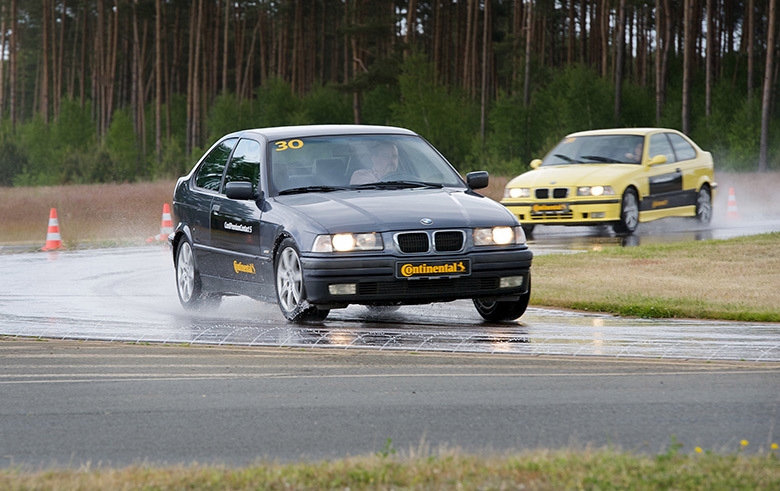 When the two cars were tested back-to-back on the wet handling course at the Contidrom, the 15-year-old car showed a marked improvement in performance as the greatly improved grip enabled braking and steering commands to be executed more safely and precisely. This allowed the car to make up, at least in part, for the absence of electronic stability control. The performance of the new car on the old tyres dropped away substantially, however. It seems that even the most advanced driver assistance systems are not able to offset the development progress made between the old and new tyre models. Tyres bear a large share of responsibility for active safety. Only technologically advanced premium products can guarantee short braking distances, a high level of steering precision and strong directional stability, and ensure aquaplaning is avoided. That is why Continental recommends fitting premium tiyes even on older passenger cars, to help offset the absence of the latest safety and assistance systems. The comparison test also highlighted that even new vehicles equipped with an array of assistance systems will only achieve maximum performance if their tyres can transfer the dynamic forces to the road and translate them effectively into grip.